Anyway, I am a fan of the lima bean. I think it all started as a child — after being presented with a bowl of Campbell’s vegetable soup, I would begin my hunt of picking out all the lima beans and eating those first. When they were gone, I was less enthused about the soup. 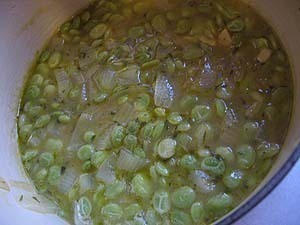 So really, it is my destiny to create a recipe for a soup with just lima beans. 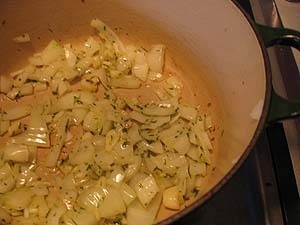 In a soup pot, heat the oil and saute the onion and garlic until soft. 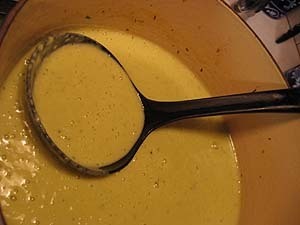 Add the dried tarragon and mix to combine. Next, add the frozen beans and the chicken stock. Bring to a boil and simmer about 20 minutes. Add the parmesan cheese and milk. Stir and remove from the heat. 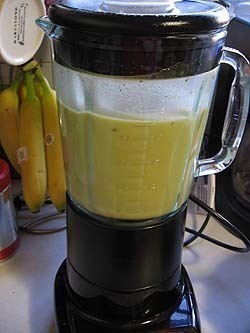 Let cool briefly to blend safely. In batches, puree until smooth. Return to the pot and salt and pepper to taste and rewarm as needed. Thanks again to the well seasoned cook for hosting a fun event! Lovely, Michelle. 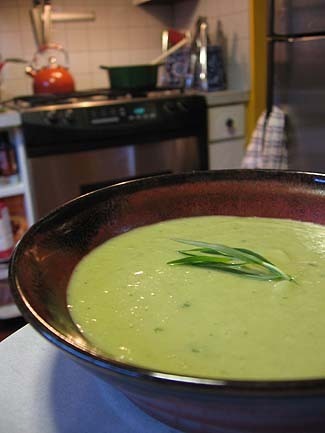 What a great idea to create a creamy lima bean soup w/ tarragon and Parmesan. Heavenly. Do you know if this is a sneaky way to get non-lima lovers to eat them?